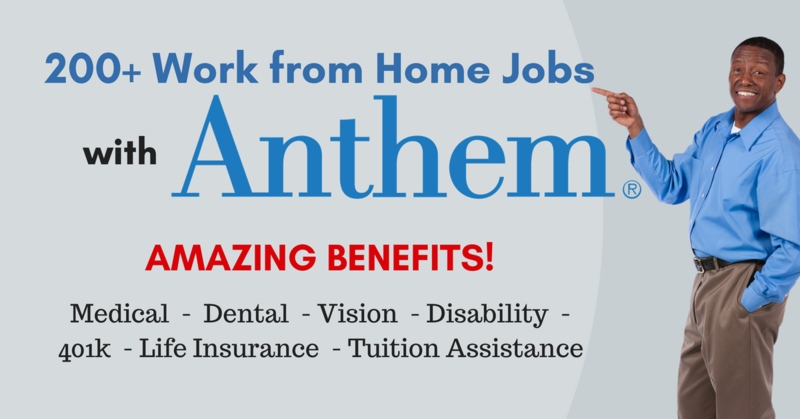 Anthem is one of the largest health benefit companies in the US. It has 53,000 employees and assets of $65B. The company frequently hires work from home employees and is regularly listed as a top employer for telecommuting. A current search for work from home, remote and telecommuting positions yields over 200 jobs, with benefits. Some have signup bonuses of up to $3,000. Roles include Recruiting, Project Director, Benefits Analysts, Nurses, IT and many more. To access the jobs, click here and select “Nationwide” under “Location Type.” You can find others by searching with keywords (without quotes) “work from home,” “[email protected]” and “telecommute.” It takes a little digging, but there are many to choose from. To see more jobs like these, check our Newest Jobs & Gigs page. May you be working from home soon!